As vintage Bashar sessions go, this one is a golden oldie. 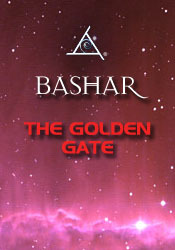 The Golden Gate is about exploring the link between the channeling experience and conscious manifestation. Bashar suggests that we think of it not so much as channeling from the higher planes to Earth, but instead think of ourselves as a gate or an interface between fluid and crystallized reality. He describes the golden fluid of our consciousness, and explains how we create our experience within that context. By keeping our consciousness fluid as in the channeling state, we make our realities more flexible and malleable. Bashar is always good for an unexpected, unorthodox perspective, and this is no exception. Using crystal skulls with dolphins. Dealing with a non-supportive spouse. Chronic fatigue & following your excitement. Balancing through crying & breathing. Struggling with deep feelings of unworthiness & incompetence. Identifying fully with a symbol. How Earth differs from other places. Transforming negative judgment from others.